by Kolur Puttaswamy Raju MS1, Mohan Kumar Jagadeesan MS1, Madhusudan Gururajarao Mch2, Dashavar Sreekantaiah Gangadhara MD3. Extra-abdominal desmoid tumor is a rare tumor and only a few cases occurring in the foot have been reported. They are benign but locally aggressive, and wide local surgical excision is the treatment of choice owing to the high rate of recurrence in the lower extremities. Invasiveness into the surrounding soft-tissue structures often makes wide excision difficult without compromise of function. 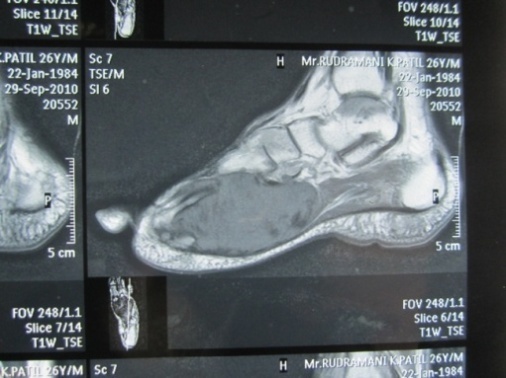 A 20-year-old man presented with gradually increasing swelling in the plantar aspect of left foot. He had a mild, dull, aching pain in the foot with increasing swelling. Wide local excision was done and the tumor was found mainly in the subcutaneous tissue, which histopathologically proved to be an extra-abdominal desmoid tumor. This case had an abnormal radiological appearance of the metatarsals with thinned sclerotic cortices. The patient had no recurrence at two year follow-up. Desmoid tumors, also known as aggressive fibromatosis, are an extremely rare entity is a locally infiltrative fibroblastic tumor that arises from fascial planes of soft tissue but does not metastasize. It is known to invade muscle, subcutaneous tissue and neurovascular structures. However, bone involvement is very rare and there have been few reports of bone involvement . Desmoid tumors originate most frequently from abdominal fascial or musculoaponeurotic structures, although they may appear at extra-abdominal sites. The most common extra-abdominal locations include shoulder, chest wall, back, thigh, and head/neck [2,3]. Extremity desmoid tumors are extremely rare. Desmoid tumors are unpredictable. Some tumors grow at a rapid rate. This can cause concern for an underlying malignancy. Other tumors remain unchanged after diagnosis. There are even instances of spontaneous regression. This erratic behavior makes treatment challenging. Treatment options vary. How a desmoids tumor is treated can depend upon the location of the tumor, its characteristics, and patient preferences. Surgery to remove the tumor is the preferred treatment method. However, it can be difficult during surgery to determine the limits of the tumor’s reach. This is because desmoids are not well encapsulated and they can intertwine with other tissues. The tumor can return after surgery, with local rates of return ranging from 25% to 68%. Desmoid tumors are notorious for invading a limb’s vital nerves and blood vessels. This means that full removal of the tumor may impair function in the surrounding area. In cases like these, limited surgery combined with additional treatments, such as radiation or chemotherapy, may be successful. 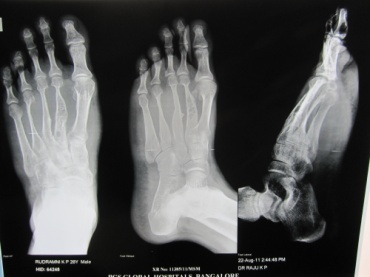 Figure 1 Plain radiographs of foot. Figure 2 MRI of foot. Figure 3 Intraoperative appearance of mass. A 20-year-old male presented to us with a mass in the left foot of two years duration. It was initially small in size but slowly progressive and causing difficulty in walking. On examination he had a 4×5 cm swelling on the plantar aspect. Radiograph showed deformed second, third, and fourth metatarsals with sclerotic cortices (Figure 1). 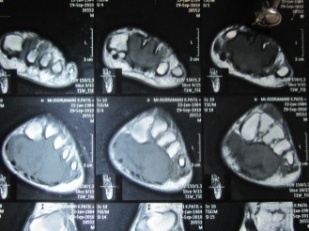 MRI showed a soft tissue mass arising from the deep fascia and engulfing the metatarsals (Figure 2). He had undergone previous biopsies which were inconclusive. Excision of the mass was performed, which was extending from the plantar to dorsal aspect engulfing the metatarsals (Figure 3). The 2nd and 3rd metatarsals were also excised along with the mass. 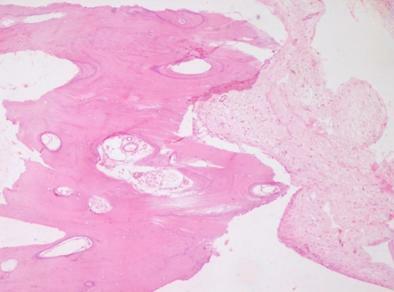 Histopathology confirmed the diagnosis of extra abdominal desmoid (Figure 4). There was infiltration of the bones. Postoperatively the wound healed well. Two years follow up revealed no recurrence and patient was walking full weight bearing. The incidence of desmoid tumors has been reported as 2–4 cases per 1 million [2,3]. They are typically derived from the abdominal wall, the bowel and its mesentery, or in extra-abdominal sites such as chest wall, shoulder girdle, inguinal region, and neck. Extra-abdominal desmoid tumors, as seen in our patient, very rarely originate from the extremities. The histologic appearance of the tumor is usually consistent in various microscopic fields within a given case as well as from case to case. Desmoid tumors are described as dense, collagenous lesions with intertwining bundles of spindle cells without epithelial components. The tumor cells are uniform and lack mitotic activity. No necrosis or pleomorphism is present . Grossly the tumor appears as a dense, hard, rubbery, grayish-white mass. It usually is a fixed tumor, and total resection often is impossible without compromising nearby structures, as encountered in our case. Radical resection is necessary for successful excision since desmoid tumors tend to recur locally. However, surgery, radiotherapy, or both are regarded as the treatments of choice for these lesions . MacFarlane J. Clinical Reports of Surgical Practice of Glasgow Royal Infirmary. Glasgow, Scotland, 1832. This entry was posted in Uncategorized and tagged Extra-abdominal desmoid, tumor, wide excision. Bookmark the permalink.